[Loc] Dany's Surgery - page 8 - meet the mods & staff - Furtopia | Family Friendly Furry Forum and IRC Chat! Loc and the amazing technicolor dreamhair! 27 eggs. 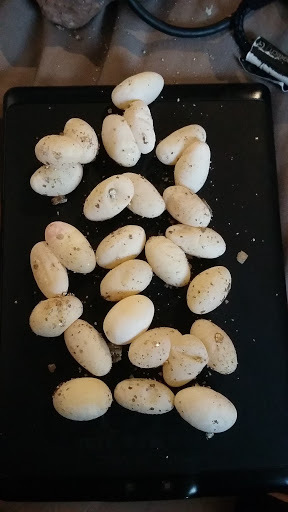 All in one clutch, laid a few hours ago by my darling little bearded dragon. As last time, she looked tiny, scruffy and exhausted. And once again, oddly for a beardie, she was guarding her nest. She objected a little when I took her out to dig the nest up, but calmed down when I gave her a dish of water and a plate of calcium-dusted waxworms, both of which she stuffed her snout into with glee. She's now relaxing under her heat lamp to rest and recover. For some reason I was half asleep earlier and thinking dany's name was dany-floofs. What would you do if one day dany was suddenly fluffy but otherwise completely happy and healthy? Braid her tiny little floofs and embrace her new life as the only fluffy dragon. She's brumating for the winter now. I wake her up once a week to give her a drink and a little bit of food, but otherwise she sleeps solidly. Dany continues to do well. She's feeding herself now and is very active outside of her tank. She has started shedding her face, and spends most of her time slithering around on her belly, rubbing her snout on every surface she can. Vivec is in the middle of breeding season, so is being a little handful. 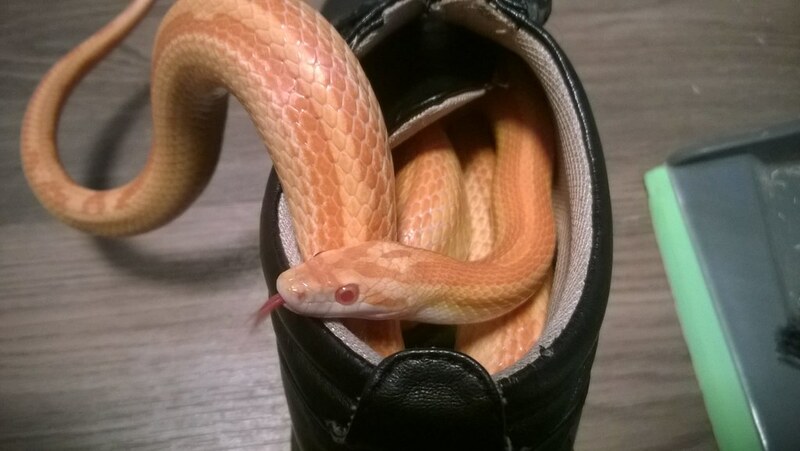 He's also sleeping in the open so he doesn't miss any lady snakes that might happen past, but does tend to get started awake and start rattling his tail. He also decided to take his last feed underwater for no good reason, but it didn't do him any harm. He's outgrown two more hides, and is very suspicious of the new replacement hide. He's about four foot long now, and looks to be set to grow to five foot or more. It's also breeding season for Gelby, who has stopped eating and started parading around her tank, showing off her new skin. She's not had more than the odd waxworm here and there in about two months, and probably won't start eating properly until mid July. She's dropped down to 99 grams, which is still a good weight for her size. 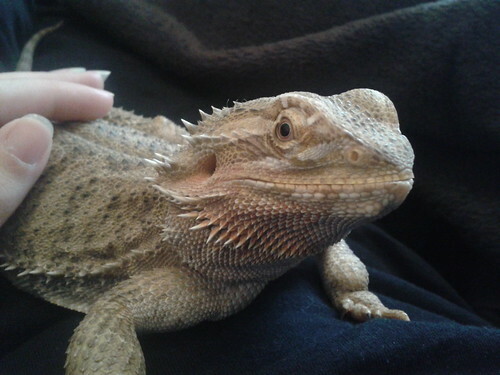 Five years ago today, I adopted little Dany :3 A tiny little disabled beardie, who had had a tough upbringing and had bones issues. Today she is a happy, active critter. Still small, but significantly larger than she was. Rapidly approaching the third birthday of this little nose. Vivec is three years old today :3 And still as cute as a button. He's still growing in length, and might wind up just under five foot by the time he starts bulking up. Although he's pretty much mature now and should be done with his growth spurts, so we'll see. He's already on large mice, and if he gets much larger I may have to swap him over to rats. it also means this coming spring/summer, I'm expecting a handful as his hormones kick in fully. The summer just gone, he was interested in a vague way, but not quite sure what to do as he was still young. Gelbstoff had to go to the vet a few weeks ago. I was concerned that she had turned brown. 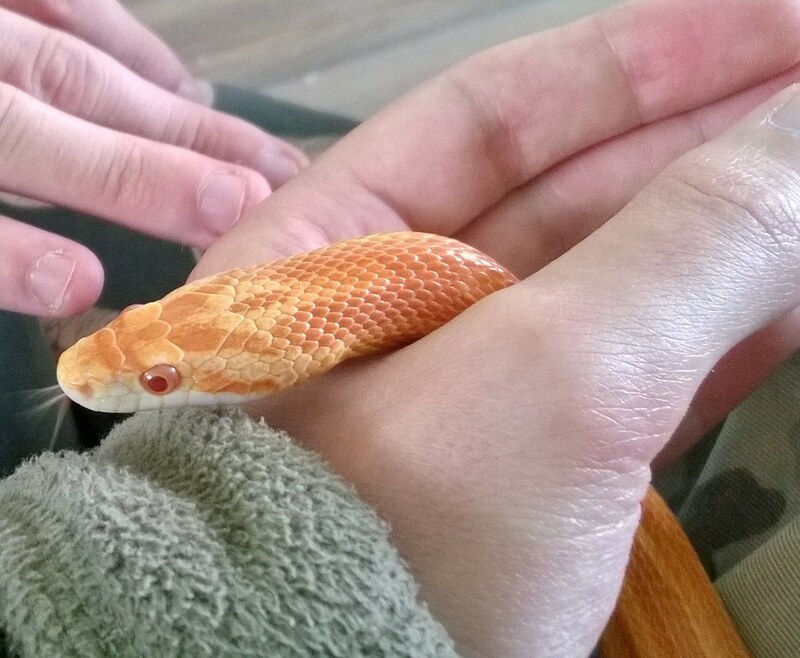 Turns out they change colour when they get chilly (it had never been a problem before - I knew that some species, including Dany, change colour with temperature but wasn't aware leopard geckos did) and she just needed her heat mat turned up a few degrees. She has been declared a healthy weight, with a fine plump tail, if a bit feisty. I was told to get her out of her tank more, if she will tolerate it, so I bought a playpen. She's... not convinced by it. She gets a bit scared and tries to hide under things. Her hammocks are back up in her tank, thanks to Fern, a drill, and some hooks. Now I just need to tweak the height on them so she can climb on and off them easily. Dany is properly down for the winter. She wakes up twice a week for food, and occasionally turns around in her sleep under her basking log. She is much more fond of the playpen, and will splodge out in it next to a heater while I clean her tank. When the weather warms up, she will be going in for a vet check and a claw trim. A very Happy Birthday to you Loc. I hope you have many more. "Showers you with chocolate chip cookies." Had a quiet night in with the reptiles and Weisseman, playing Starfinder and Warframe. 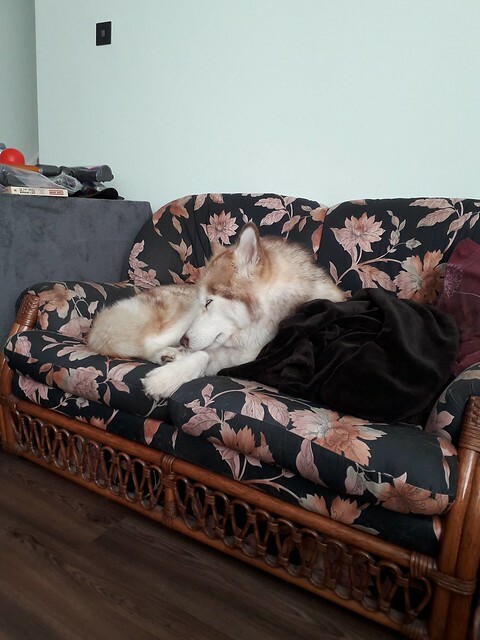 This is Kimba, a 7 year old female malamute. She looks a lot like Suki, one of Weisse's parent's malamutes, but the two are not related. Kimba had an owner, a son named Bear, and her son's father, Timber. Timber got into a fight with another dog one day - no idea who started it, but the police got involved. The owner decided they no longer wanted any of the three dogs, and they were shipped over from an island off the coast of England to an RSPCA shelter. While there, Timber and Bear were found to have such severe hip dysplacia that even with round the clock pain medication, they would have had no quality of life. They were both put to sleep. Kimba was alone. She was put up for adoption on the shelter's website on the 14th June 2018. Malamutes, despite being friendly and adorable, tend to have a hard time being adopted due to their size, strength, activity needs, grooming needs, and the fact they can be very loud, talkative dogs when they want. Weisse and I went to go and see her on the 15th June. We reserved her for adoption pending a home inspection a couple of hours later. She has since met at least one of us every day since. She gets excited to see us, and will whine and squeak happily and try to jump fences to see us. She's met Weisse's parents as well as Suki and William, who she gets along with, after some initial uncertainty. She is still suffering a little from losing Bear and Timber - they were only put down a few weeks ago, and having other malamutes to band up with will do her some good. She has also met another 7 year old dog from the same kennel, a Eurasier named Kronus (a former show and stud dog), who is being adopted by a couple Weisse and I are good friends with. They also get along well, although with occasional complaints. Kronus came from a house with 22 other Eurasiers, and can be a bit possessive of his food and water. In less good news, she has started to become institutionalised from being in the kennels and is refusing to go on walks, wanting to go back to her kennel after a short time outside, and generally being stubborn. But kennel stress, while unfortunate, can be fixed. Weisse and I had a home visit from a shelter volunteer today, and we have been cleared to adopt Kimba. We're making plans for her to come home with us on Sunday. Both of us are going to take some time off work to get her settled in and used to our house. I am sorry to hear about Timber and Bear. Kimba is very adorable, and I bet she will be a great companion! Thanks to you both for helping animals in need. The local shelter here is very keen to get dogs out and adopted, as they do not put a healthy animal down under any circumstances. 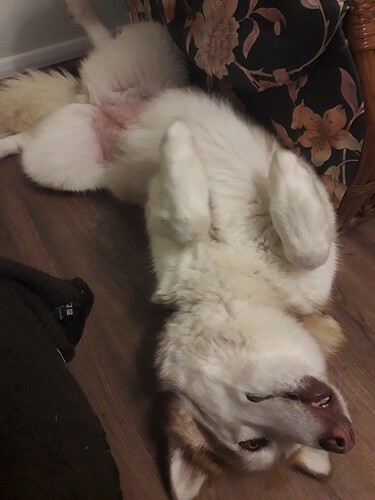 Even lifelong problems that can be managed, the animals are not put down - Kronus the Eurasier has a thyroid problem that he will be on medication for for life. We had to fill in a form about our home, jobs, plans for the pet, holiday plans, times we are out, other pets... And the animals cannot be rehomed to the area they came from, for everyone's safety and happiness - Kimba cannot be allowed to go back to the island she came from. Then there is an adoption fee - £150 for a dog. 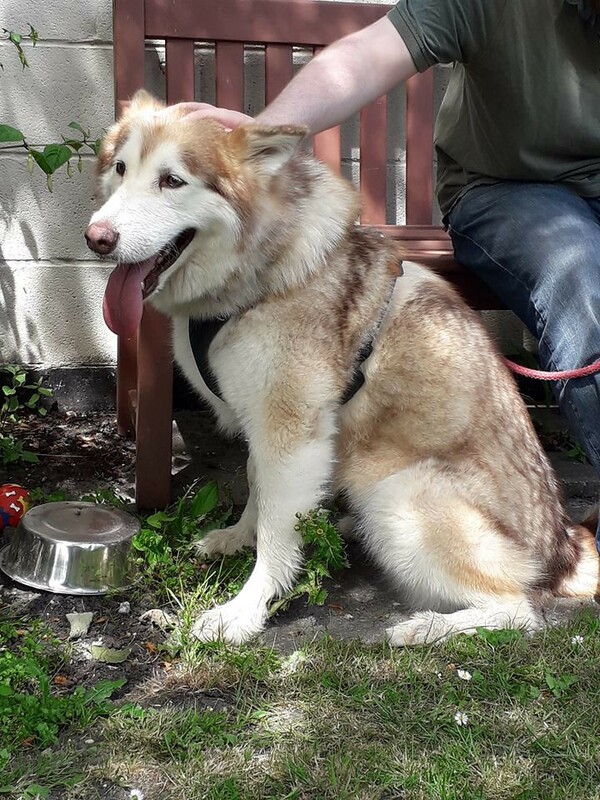 That may sound like a lot, but bear in mind a purebred malamute puppy here costs around £1,000... We also had a home visit, but it was literally to check the house wasn't a trash heap and we had a garden that would be suitable. The shelter gives you a month of food and makes sure the animal is vaccinated, chipped and neutered, but asks you have a tag and collar ready to go before they release the animal to you. Things may have gone smoother and faster for Weisse and I than normal though - I only have a part time volunteer job, so I've been going in for a while every day (except Tuesdays, when the shelter is closed to the public) to play with her and ask questions. The staff recognise me instantly and are happy to let me take Kimba on walks off-site, or take her to the private play areas behind the kennels. Weisse and I also have a lot of prior experience with the breed, so we're the ideal people to adopt Kimba. Kimba also has no behavioural problems, aside from the kennel stress. Some dogs they get in have far stricter adoption procedures. Some in the shelter currently need applications filled in and gentle questioning, as the dogs are are so shy or in some cases, can't even stand to be looked at, that they cannot be in the main public part of the kennels. I would encourage people to think about adopting a pet if they can. Three of my four animals are adopted - Dany, Gelby and now Kimba. When I was a teenager, I inherited a very elderly cat named Pixie from my grandmother, who died when I was 11. Pixie died when she was 21 and I was 15. She had three teeth, was mostly deaf, had arthritis (she taught herself to use a stairlift) and hated men, but she was a very affectionate cat to her family. Vivec is the only animal I have had from a baby. Adopted pets can have behaviour or health problems though (Dany has health issues, Gelby had a few minor behavioural quirks, Pixie had the normal issues that old age brings), and I can understand that not everyone is equipped to deal with these problems, particularly in larger animals. But if you can handle it, and give them time, they are just as affectionate and lovable as an animal you know from a baby. I agree that we need to rescue animals. It's good all around. And I am glad that you and Weiss are helping out. It's obvious that you two are ideal candidates. So, as it turned out...i got a dog anyway, from a farm. The dog had a litter, and they needed homes. I am a programmer who often can work from home, and has for 8 of the 10 years. I live 20 minutes from work and can come home when needed. I recently paid over 7000 to save her life from bloat. And have rented the same place for 10 years and it has a large yard. My dog gets to go walking everyday, hiking in the cool mountains, and sees the vet regularly. She is old now and I am sticking with her through the problems. I wish some shelters could be less strict. I could have saved a dog and given it a decent life. Instead I got a dog Not from the shelter. Some shelters forgot that perfect doesn't exist, but "good enough" is all around us. Next time I will try harder to get a shelter dog. It's what's right. And they are just as worthy and good. 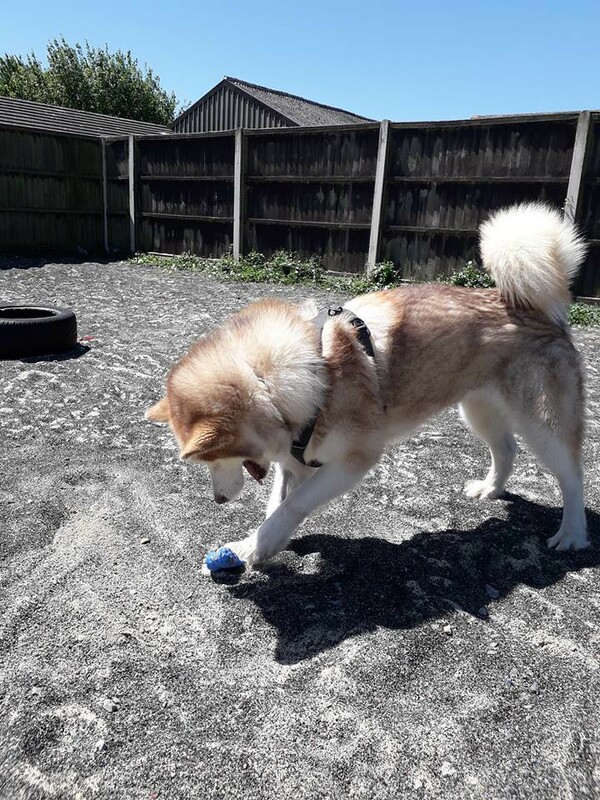 Kimba looks like she is having fun with her toy! Your dog sounds very lucky to have you! Mind if I ask to see some pictures of her? I think the shelters in this country, from what I've heard, tend to be a bit less strict that US shelters. Here, you can rescue if you rent, with a note from your landlord, and my unmarried status never factored into things. And for working, they either like you to work from home or have a plan of who you can leave the dog with during the day, so even that isn't a dealbreaker (dependant on the dog and their issues, of course). It seems odd that they would just dismiss you for those things without asking more about the circumstances (and marital status is none of their business, frankly). I'll admit I don't know much how non-RSPCA shelters work though. We're booked in to bring Kimba home on Sunday at 2pm. We've got some water bowls, treats, a months worth of teeth-cleaning chews and a couple of toys. We need to get her a collar (large, in purple) and a tag (Weisse is taken with the idea of a nice pink tag, but we'll get a cheap one first just to use as backup and when we get her, as the heavy duty fancy tags can take longer to deliver), more toys, some food dishes, a bed (she currently sleeps either on the cooler concrete of her kennel, or on an elevated bed) and harness. We'll probably also get her a crate, so she has a quiet place of her own to hide out in. She was a nightmare to get in the car. Didn't want to get in at all. Ran away back to the shelter when we tried to get her in the boot, and had to be lifted onto the back seat with me. She then whined a little, stress-dribbled everywhere, paced as much as she could on a car seat before finally trying to stuff herself onto my lap for a cuddle. She's had a walk around the house on her lead, and is now off-lead and at the point where she is following me like mad. She's still not happy - pacing around and her tail hasn't curled back up yet, but she'll sit and lie down for short periods and is eating treats and drinking. We get the occasional wag, but she's not sure she won't just be taken away from here again, like she was taken from her first home and then taken from the shelter. She has been playing with her new balls, wandering around the garden with me, and is now lying next to the sofa having a fuss while I read her behavioural notes from the shelter. It seems like she was in there for about a month, and her mate and son were put to sleep a week or so into her stay there. And we are through the first night. Kimba wasn't too bad. She has bouts of whining, which we are putting down to anxiety and itching - her stomach fur is still growing back in from when they attempted to spay her at the shelter (only to find her chip was out of date and, despite what it said, she had already been spayed). We let her roam around the house as she wanted, closing doors or putting stair gates where we didn't want her to go. I think she slept in the hallway most of the night. We were a bit worried about what she would do if she wanted the bathroom, but she came and woke us up so we could take her out. The issue now is that she's awake and it isn't time for us to get up yet, so she's restless. We also don't know what time she went out or had breakfast at the shelter. We also found out from reading her notes yesterday that she is not a pure-bred malamute. She's a malamute X. Not sure what she's crossed with, but it barely shows. She has a slightly narrower chest than I would expect, and has a way of standing that is somewhat reminiscent of a german shepherd, but that's all. She's got to be 90% mute. We are now two weeks in. Kimba is settled inside the house and garden. She sleeps through the night, and is willing to wait for her morning walk until nearly 8am. She has started actually going on morning walks now - she still refuses her evening walk. With some help from the behavioural therapist on Friday, we are training her to deal with cars. She will walk onto and across the back seats, sit in the footwell for a short time, and jump into the boot. We haven't started closing doors, securing her into the car, or moving yet. The therapist is back this Friday to start working on lead walking, so we can take her out on proper long walks. She still has separation anxiety - When Weisse went to work this morning, she cried for half an hour. I went to a barbacue yesterday afternoon and she cried for about the same. This is still an improvement over when we first got her, and she would cry for four hours or more. She is fine with Suki and William, as long as they are not in her house. Suki especially. The two girls are both very alpha personalities, and have clashed over who should be where in the pecking order. Last time, Suki came into the house off-lead (which I would have objected to had I known in advance) and they two fought. Kimba started it, and cut Suki's ear. Out in the garden, they are fine, but Kimba objects to them in the house. We're training her to see that it isn't her choice or her concern who comes into the house, as she is not in charge - Weisse and I are. In the mean time, they are only socialising outside. I will confess, I had the Puppy Blues. I wondered if we had done the right thing, if we were ready for a dog, and regretted getting her as my life had massively changed, and her behavioural issues meant I couldn't take her to all the places I had dreamed of taking her. The first week, where she refused to go out, cried all the time, and I was dealing with it largely alone (Weisse was working) was tough - I was sleep deprived as she didn't sleep through the night and I had to get up earlier than I was used to to walk her, and her upset meant I had to doze on the sofa in ten minute bursts. I'm glad to say that has gone. She is a very good, intelligent dog and I'm very glad we have her in our life. It is also the six year anniversary of Dany arriving in my house! She's had her issues - She is an ill little thing, but so wonderfully relaxed and friendly. This is the first photo I ever took of her, the first time I held her. She's better than ever these days - eating fairly well, reasonably active, considering her health problems. For Dany and Gelby, I consider the day I adopted them to be their birthday, as the actual date is unknown. 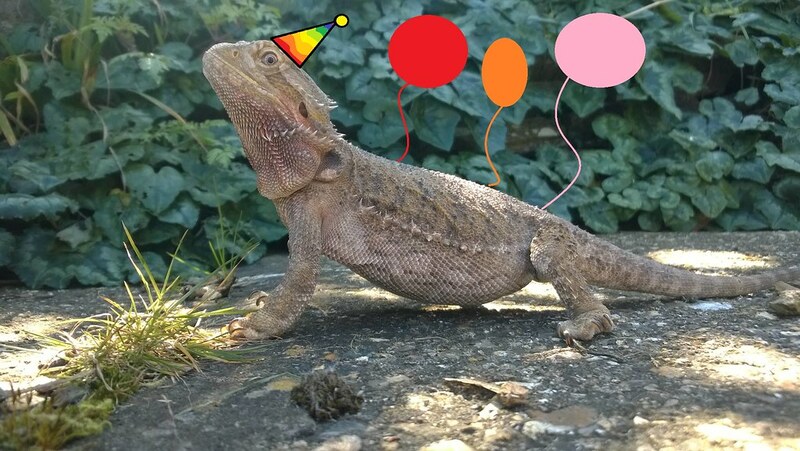 So happy birthday Dany! You are probably about 7. It's nice to hear that she's improving. Adopting an older dog means a world of issues different from a puppy but it's a wonderful thing to the animal to have a family take them in and care for them. Good on you. It's too bad you won't be able to take her to all the places you would like as well, perhaps given enough time she might be at ease enough to go there? Also good that you're stepping in and showing the girls who is boss. People laugh about the concept of a person being "pack leader" cause of the dog whisperer but it's a very true thing. I've owned enough dogs to know that if you don't step up and make some kind of show of dominance they'll stop listening to you. On another note have you considered getting a little kennel thing for her to sleep in? Reading back through the posts she seems to like smaller places and while watching a youtube channel gonetothesnowdogs their dog Oakley sleeps in one but it's not closed or anything. I think they removed the door so it's basically a metal box with one opening; with a doggie bed inside and some blankets laid over the top to make it dark. We hope, with a couple more sessions with the trainer, we will be able to get her in cars and on proper walks. Short ones to start with, but she's already showing massive improvements after one session so we are hopeful we will have her going to the park and on good walks or short car trips in a few more months. The trainer we have did learn from the Dog Whisperer for a while, and her training school is called "Leader of the Pack". She is big on "you are the leader, your dog should respect you, they are pack animals and they see you as pack". 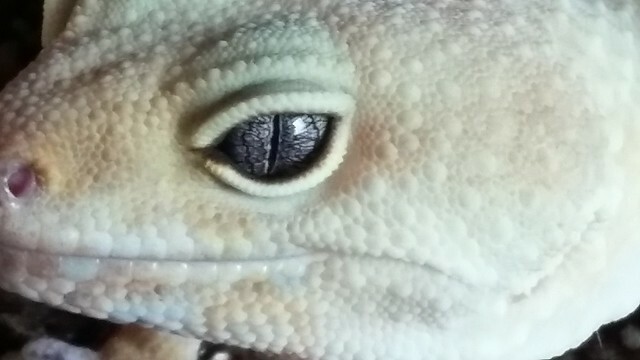 Part of the issue I had is that I have only owned pets which don't have a strict social structure, or any at all (non-social reptiles), and I was treating Kimba too much like them. It's a bit hard to break myself of that, but she is showing improvements and listening to me more. The training is less about forcing a dog to do what you want and more about making the dog realise it can't always do what it wants. She is a well trained dog, for a lot of things, and she is intelligent, a quick learner - we've already taught her the cues for going on a walk and to jump onto a surface, and we're working on the command to go to the bathroom before bed. She is also intelligent enough to know when she can get away with being stubborn, and in the shelter she got away with it all the time - She didn't want to go on a walk? Well, shelter was understaffed, don't have time to train her, take her back to her kennel and leave her be. She has a large crate to sleep in, covered over with a blanket, and lined with the blanket she had in the shelter. Weisse's parents two malamutes, Suki and Will, were both crate trained as puppies and see their crate as a safe space to hide out in. Kimba refuses to use it. Won't go into it. Her ball went inside it once and she stretched her neck as much as she could to get it without going in. She doesn't seem to really like small spaces. She has options of where to sleep all over the house, and she chooses an open space in the living room (or on a sofa - We showed her she was allowed on sofas early on, as neither of us had any objections to her being on them with us. Getting her onto sofas and the bed also helped with the "jump up" command, which we now use to get her into the boot of the car). I don't know if she was ever crate/kennel trained, or if being in a small space reminds her of unpleasant times, but she doesn't like it. She's sleeping well and through the whole night now, so we're just leaving her to it. My family used to have a lot of dogs. A lot of dogs and many were kind of small, runty dogs but they were all very smart. One that we had, named "Dog" could even speak some words in english! Maybe it was because his parents were brother and sister I'm not joking they were. But Dog knew how to say some words. I'll never forget the first time we discovered it. Anyway mom and I were moving stuff in and Dog wanted out of the cage, I feel it's important to note we treat our dogs like people; like human beings wearing fur, and we talk to them as though they understand everything we say. Mom and I looked and saw Dog scratching furiously at the cage, wanting out. Mom held a hand up and said "Hey, we'll let you out in a minute just wait." Dog let out this long whine, this shrill, high pitched whine and opened his mouth and in a strange mix of howling, whine and growling at once he let out this wail that sounded like scooby doo after taking a kick to the...you get my meaning. The words were clear. "I want out." or more like "Rye ruhun ow"
Mom and I heard him wail this repeatedly and we looked at each other like we'd seen a ghost. "Did he just say he wants out?" My mother asked. "I'm glad you heard it that way too." I replied. Dog continued scraping his claws against the cage, desperately trying to dig his way through. "What did you say?" Mom asked. Dog paused and looked at her, then ducked his head down and dug at the floor of the cage and once more wailed "Rye ruhun ow" with Freeway laying beside him like nothing was wrong. What else could we do? We let him out. An animal screams in your own language what they want how can you refuse? And Dog was able to speak a few other words. Whenever our big Border collie/lab mix dog Milo disturbed his sleeping Dog would get up, let out a series of growls and when we listened He'd say "Milo" within those growls. And only when Milo did it. If someone else bothered him we would't hear it. We tested it out by waking him up from naps and while he'd do the various low growls like someone grumbling under their breath he wouldn't say "Milo". And as for Milo, he was very intelligent. My dad trained Milo to fetch his harness for walkies, his leash/lead, to hand dad the proper end with the clasp and also to fetch dad's mud boots (Wellies) for when it was muddy out. Sorry this went on kinda long. I just have a massive love of how intelligent dogs can be when people treat them the same as people. Obviously you still have to maintain the pecking order of the pack, but you need to do that in human social groups as well so we're not that dissimilar from each other.